Yes, we’re tucked away at the opposite end of the world but that doesn’t mean the flavours, colours and rustic, romantic vibes of the Mediterranean are out of reach. 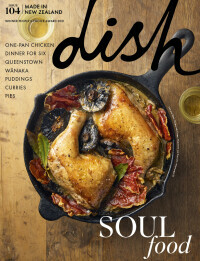 Dish spoke to some food visionaries who are bringing some of that passionate Med magic to the New Zealand culinary landscape. Aucklanders can count themselves lucky Damaris Coulter discovered alcohol young. Because what started as her booze ban from the local Mediterranean restaurant, segued into a metamorphic move to Italy – one which eventually inspired the gingham-checked food and culture cornucopia, otherwise known as K Road’s socialist eatery, Coco’s Cantina. Growing up in rural New Zealand, in the Far North, both sisters earned their hospitality stripes, working in fish and chip shops and doing the milk run while still at school. Along with time “in the trenches” in restaurants in Rome, Sardinia and London, it’s an education Damaris is eternally grateful for. “Anything in a restaurant or a bar or a cafe we had done. We had worked in every single area and even then, we were afraid to open our own restaurant.” Using fear as a motivator, eight years in, she’s still pushing boundaries and never stops learning. “I probably know more about plumbing than I should because I own a restaurant. I probably know more about teenage psychology, pregnancy tests, hangovers and drugs. And I don’t drink or take drugs.” The welfare of her workers is something that Damaris takes very seriously. She has a vision her staff will eventually only work 38-hour weeks and be paid a good wage. Along with the business and work on her website and soon-to-be launched app, The Realness – a platform to raise global awareness for single owner-operated restaurants – it’s going to be a big year. “I’m thinking of having Sardinia as our (The Realness app) launch location because if you drill straight through you’d hit New Zealand. It’s like a sister city and is predominantly owner-operated. To learn more about Damaris or meet our line-up of local Med stars, pick up a copy of our April/May issue, or follow our Med series online.